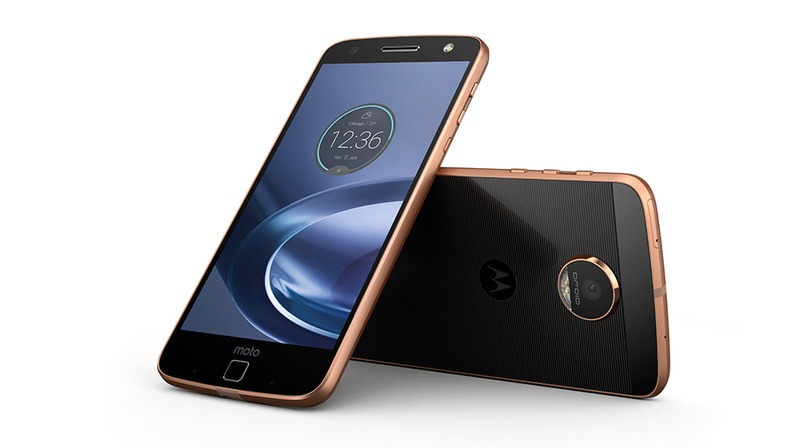 Today at Lenovo’s Tech World event, Lenovo and Motorola announced a plethora of new products, including two new smartphones, the Moto Z and Moto Z Force, which replace the Moto X Play and Moto X Style/Pure Edition at the upper end of its lineup. As the change in letter designation suggests, these new phones differ significantly from Motorola’s previous offerings in both design and function, in addition to the usual hardware upgrades. Both Z models share much of the same hardware. They both use Qualcomm’s Snapdragon 820 SoC, with four custom Kryo CPU cores running at up to 2.15GHz and an Adreno 530 GPU, paired with 4GB of LPDDR4 RAM—the same formula most current generation flagship phones are using. Both models offer two storage options based on UFS 2.0 NAND, 32GB and 64GB, and support storage expansion with a microSD card. The Moto X family uses IPS LCD panels, but the Moto Z family switches to AMOLED. At 5.5-inches, they’re also slightly smaller than the Moto X’s 5.7-inch display but retain the same QHD (2560x1440) resolution, giving the new panels a pixel density of 535ppi. Motorola has not said if the new displays support a wide color gamut like most AMOLED displays or if there’s a proper sRGB mode. Motorola has been delivering some nice looking screens the past couple generations—the Moto X Pure Edition’s panel is particularly well calibrated—so hopefully this attention to detail is applied to the Moto Z. 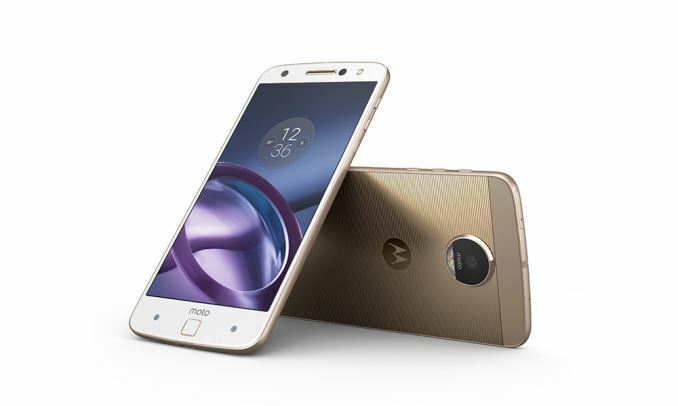 Both Z models include a touch-based fingerprint scanner on the front and Motorola’s latest TurboPower fast-charging technology that supposedly provides up to 8 or 15 hours of battery life in just 15 minutes for the Moto Z and Moto Z Force, respectively. While neither phone is water and dust proof like Samsung’s IP68 rated Galaxy S7, they do include a water-repellant nano coating that helps protect them from accidental spills or light rain. Like the Moto X Pure Edition, the Moto Z models have 5MP front-facing cameras with a dedicated flash. Around back, the Moto Z uses a 13MP sensor with laser assisted autofocus paired with an f/1.8 lens and optical image stabilization (OIS) to help improve low-light performance. The Moto Z Force also includes an f/1.8 lens and OIS, but increases resolution to 21MP and upgrades to a hybrid autofocus system that combines phase detect autofocus (PDAF), laser AF, and traditional contrast-based AF as a fallback to improve focus speed and accuracy. The Moto X Pure Edition also has a 21MP rear camera with PDAF, but it appears the Moto Z Force is not using the same Sony IMX230 Exmor RS sensor. Instead, Motorola is using a new sensor that adds Deep Trench Isolation (DTI) technology to improve color fidelity. 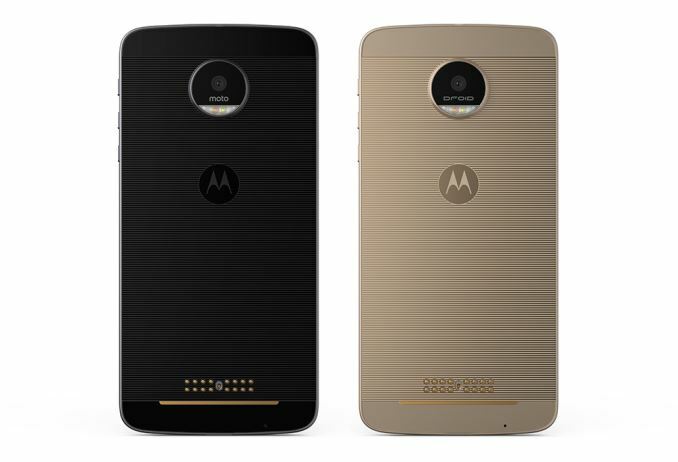 Motorola uses a similar design language and materials for both Moto Z models, fusing an all-aluminum chassis with edge-to-edge cover glass on the front. The antennas appear to be located behind plastic inserts on the top and bottom of the back panel, but we will not know for sure until we’ve had a chance to see the phones in person. While Corning’s Gorilla Glass protects the Moto Z’s screen, the Moto Z Force uses second generation Moto ShatterShield technology to further protect the screen from cracking or shattering if dropped. A five-layer system, Moto ShatterShield uses an aluminum panel below the AMOLED screen to keep it from flexing. A dual touch layer provides redundancy in case one of the touch layers is damaged. Finally, two separate lenses, one of which is likely polycarbonate, provide resistance to cracking and scratching, which is backed by a four-year warranty. The phone’s earpiece doubles as a mono front-facing speaker, which leaves only the USB Type-C port on the bottom edge. If you look closely, you’ll notice that there’s no 3.5mm headphone jack; the Moto Z uses the Type-C port for audio. This will surely be a divisive decision, but Motorola is at least including a 3.5mm to Type-C port headphone adapter. Of course, using the adapter means you cannot listen with headphones and charge the phone at the same time. The relatively large lower bezel is also a concern, because it may further limit the ability to reach the upper portion of the screen and to comfortably use the onscreen keyboard. Motorola’s decision to use a square fingerprint sensor is partly to blame, but it also looks like the display’s control circuitry is sitting behind the “moto” logo below the screen. This less than advantageous placement is probably the result of the Moto Z’s razor-thin chassis. The Moto Z is only 5.19mm thick, while the Moto Z Force is just under 7mm thick. There’s a reason why Motorola opted for such a thin design, which I’ll discuss in a minute, but first we need to consider the other side effects of the Z’s slim chassis. The most obvious is how far the rear camera module protrudes from the back. The more serious issue, however, is the impact on battery capacity. Motorola was able to squeeze a 3500 mAh battery into the Moto Z Force’s thicker body, but at 2600 mAh, the Moto Z has a relatively small battery for a phone with a 5.5-inch display and high-end SoC, leading to concerns about battery life. 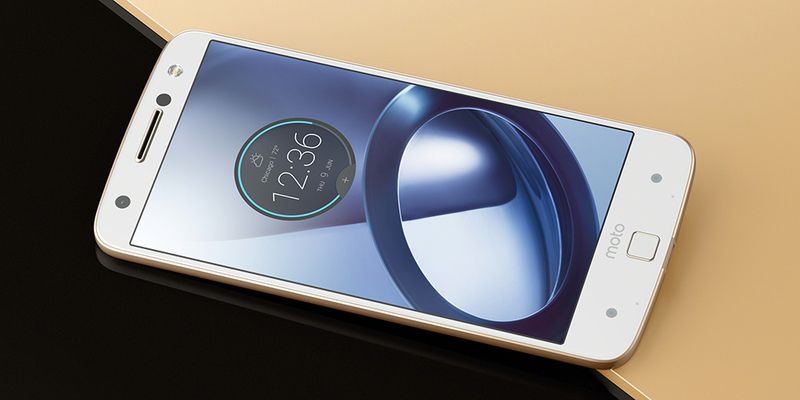 So why did Motorola push for such thin designs? Because of its modular accessories it calls Moto Mods that snap into place on the back of the phone using strong magnets. These accessories all add additional thickness to the phone, so eliminating unnecessary bulk was a priority. Initially, there will be a range of real wood, leather, and fabric patterned decorative backplates that sit flush with the rear camera when snapped into place. There’s also the JBL SoundBoost speaker that adds two 27mm diameter, 3W speakers; a built-in kickstand for propping up the phone; and an additional 1000 mAh battery, along with the Moto Insta-Share Projector, which outputs a 854x480 WVGA image at 50 lumens nominal using DLP technology. Incipio’s Offgrid Power Pack adds a 2220 mAh battery and the option to add wireless charging support. Motorola says the Moto Mods are automatically recognized when snapped on and only require a one-time setup process. Unlike with LG’s modular G5, the Moto Z does not need to be rebooted when swapping modules, which is a definite plus. Also, Motorola says that Moto Mods will be compatible with future generation phones, although how far this will extend is unknown. 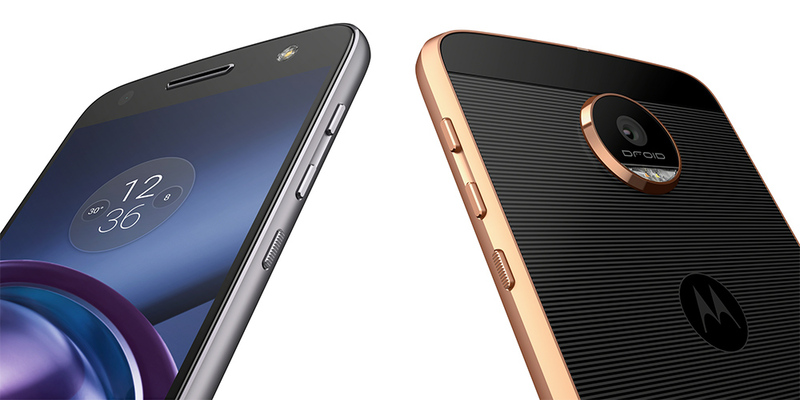 In the U.S., both phones will initially be Verizon exclusives under the DROID brand. 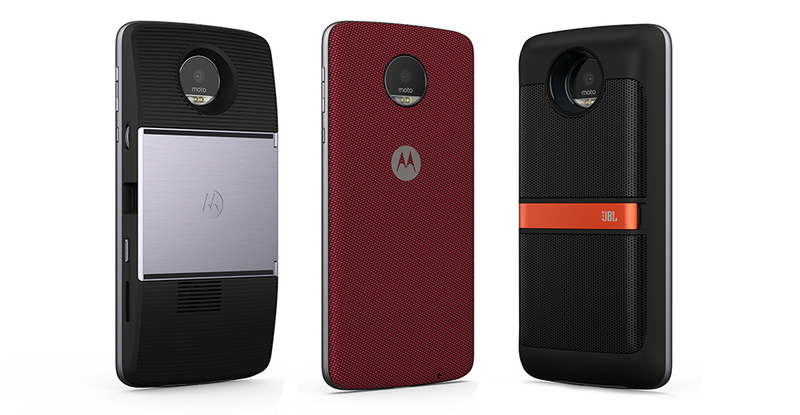 The Moto Z DROID Edition and the Moto Z Force DROID Edition will be available this summer along with the Moto Mods announced today. The Moto Z will be available unlocked this fall from moto.com and various retailers. There will also be an international version of the Moto Z available in September. Pricing has not been announced yet.